Another Intel Developer Forum (IDF) has been and gone and still we're wondering why Intel can't do mobile. Right now, ultramobile - tablets and phones - is where it's at. It's where all the exciting innovation is happening. It's where all the growth and money is. So, it's borderline bizarre that Intel isn't merely failing to dominate. It's barely in the game. So far there's been jjust one mass market phone available powered by an Intel processor - the Orange San Diego. One thing's for sure. If it had some handset design wins to shout about, the likes of Intel's mobile maestro Dadi Perlmutter would have been prancing around the IDF stage in rapturous triumphalism. In terms of overall numbers to date we're talking about the fingers on one hand, including the newly-announced Motorola Razr-i. That's all Intel has to show for nearly five years of retail Atom processor sales. From what I heard, there are even rumours doing the rounds regards Intel pulling the plug on Atom. That could actually make a lot of sense. And it wouldn't meaning giving up on the ultramobile dream. The most exciting thing that I can see on Intel's horizon are Windows 8 tablets powered by proper Intel Core chips, not weedy Atom processors. My reasoning here is that if you want a tablet with a relatively feeble processor, there are already plenty to choose from in the form of Apple iPads and various Android tabs. Tablets with ARM-based chips, in other words. Where Windows 8 can make a difference is by fusing the tablet experience with the power of a proper PC. For me, it's going to take no less a proposition than that to turn punters' heads. Put another way, the same but a bit different is all Windows 8 on Atom has to offer. And it's not even close to being good enough. That's why PC manufacturers are turning to Core. In the long run, maybe the same thinking applies to smartphones. 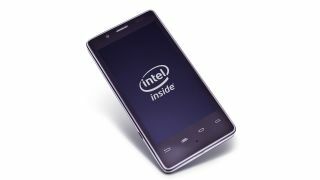 If the Windows-8-plus-Intel-Core proves a success for tablets, there may yet be hope for Intel in smartphones if it can drive its flagship computing architecture into that most ultra of mobile form factors. If that sounds implausible, Intel confirmed at IDF that Moore's Law is good for another 10 years. In practice, that means 5nm chips by the end of 2020. In theory, that would make it possible to produce a quad-core Intel Core processor with proportions measuring just over six per cent of today's 22nm effort. OK, to that you'll need to add a whole bunch of additional bits to create an SoC fit for a phone But you get the idea. An Intel Core phone chip inside a decade is not science fiction. In truth, nobody outside of Intel knows exactly how it currently intends to crack the ultramobile nut. But I can say this for sure. If it doesn't manage it fairly soon, there will literally be no need for Atom because Intel Core processors will have been crushed down to smartphone-esque proportions.